Steve and Andrea Roberts, George Kadoke PDG Brian and Dorothy Menton , Ron and AG Margaret Walton, Elizabeth Harvey, Doug Patterson, Mike Davidson, Tony and Susan Davidson, Andrew Walton and Kat Beck, Linda Cantle, Beverly Rogers, Sue Whitley, Dan Herbert and Janet Stead, John and Pat Hulme, Girvin and Cheryl Devitt, Carol Cartier and Pete Burrell, Mike and Maryanne Kinsey, Marc Durocher and Lisa McCoy. We have a local guide and translator, Sophea, that travels with our team. Rotary Clubs represented on the trip are: Matheson, Gravenhurst, Bracebridge, Haliburton, Washago & Area Centennial, Bridgenorth-Ennismore-Lakefield, Parry Sound, Barrie-Kempenfelt and South Georgian Bay. 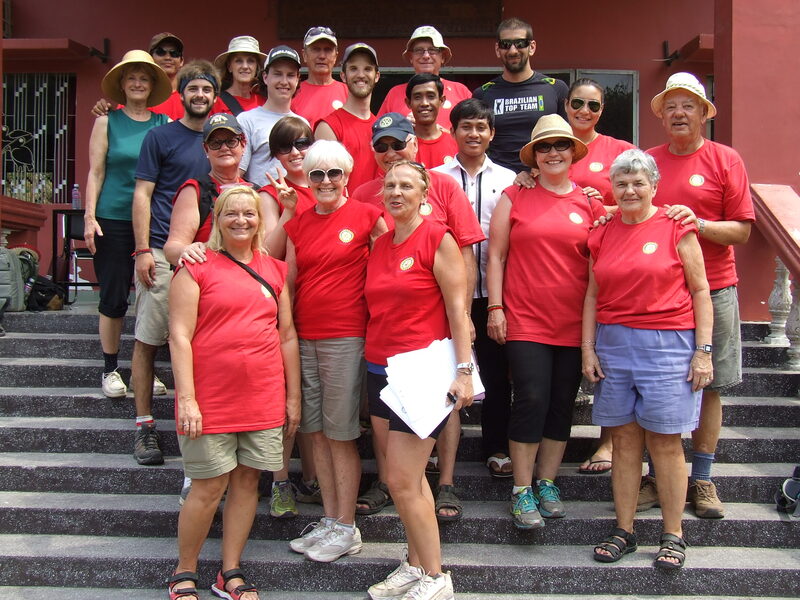 The team arrives in Phnom Penh Cambodia on Tuesday, January 28th, 2014 and will spend 3 weeks distributing bicycles to needy students in the rural areas. Our current goal is to distribute 800 bicycles in 9 target locations – but we are happy to provide more if donations pour in. Along with distributing bicycles, our team will be bringing over donations of schools supplies, used eyeglasses, toys and children’s clothes which we will give out at the schools and orphanages that we visit. At every bicycle distribution, a Cambodian dental professional will provide a dental hygiene lesson to the children, families and teachers there – so, we are also looking for donations of toothbrushes and toothpaste. 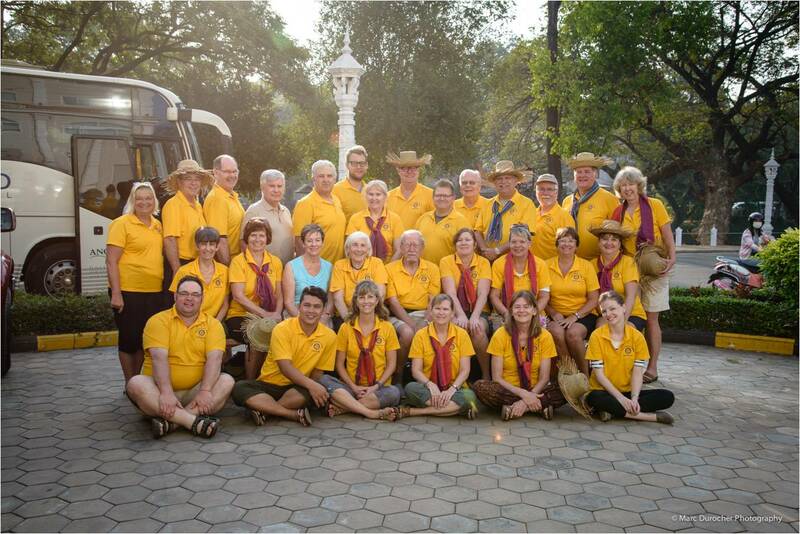 Some of our distributions will be done with members of the local Rotary Club of Battambang. We will attend one of their meetings and enjoy a Cambodian dinner with them. 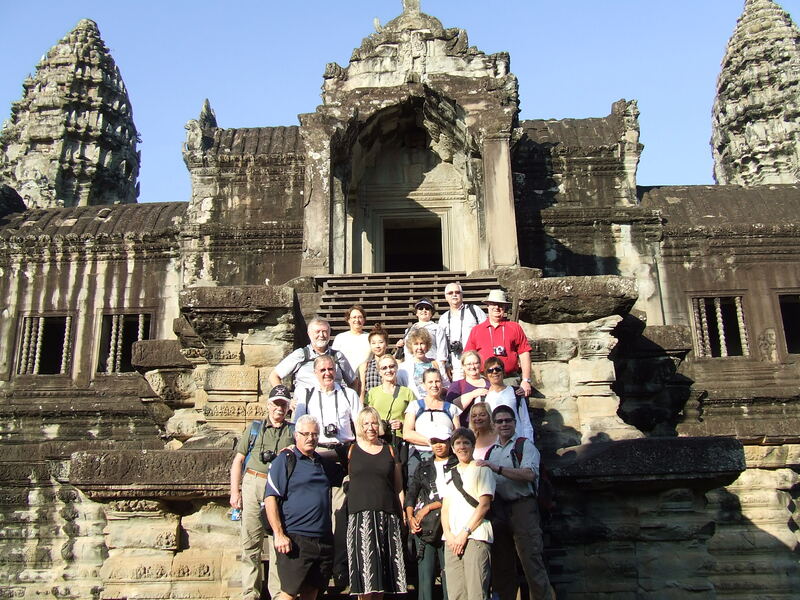 Our team will also get to visit many of Cambodia’s historic sites including: the famed temples of Angkor Wat, The Tuol Sleng Genocide Museum, the Killing Fields, the Landmine Museum, the Royal Palace and National Museum. Our team enjoys local boat trips, cyclo rides and even ride the famous ‘Bamboo Train’. We see a lot of rural Cambodia that the average tourist does not see. Our past two service trips to Cambodia saw a total of 2,328 bikes distributed to needy children enabling them to swiftly cover the miles to school. In the past 2 years, we also distributed 4 tons of rice, 1,231 family-sized mosquito nets and thousands of toothbrushes and toothpaste. 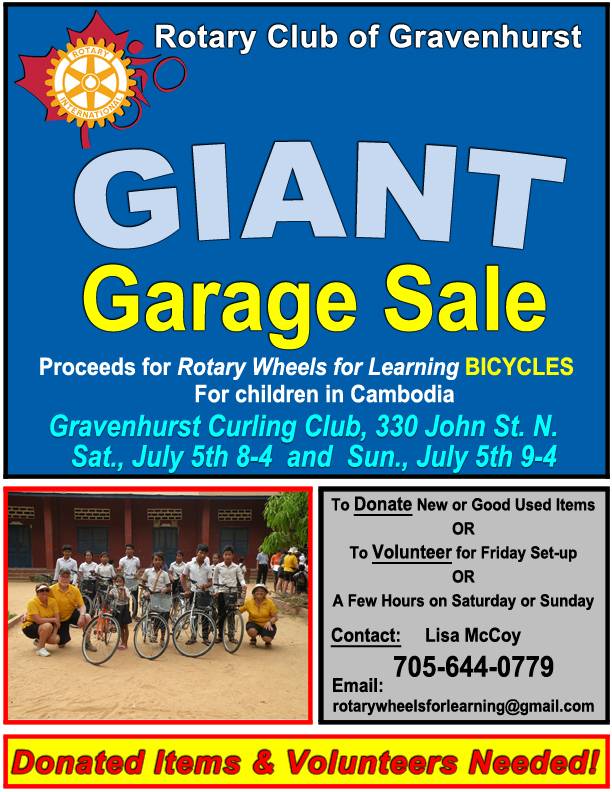 Previous GIANT Garage Sale a huge success – adds 60 Bikes to enable Cambodian Children to go to school!